Las Vegas, NV (W&HM) - The CES show has a really cool auto + accessories section. There are cars that you don't see usually from a car show and there are equipment that you don't touch in ordinary showrooms. Here are a few glimpses of the show that are related to cars. 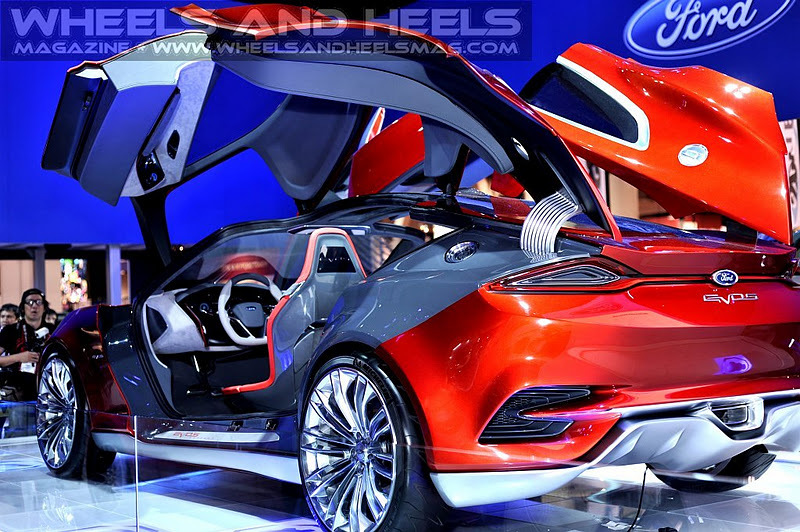 Ford's concept car, Evos (above) looks spectacular!! By merely placing a sleek super sportscar on a platform can attract a great attention to the company. The Ford concept car, EVOS!!! Hand on the headphone in a Formula One car???? Two wheels are sometimes fun too! Now this tiny dude on the bicycle is really cool! He/She/It can ride the two wheel bike (no third one) down the curved path at super low speed. Sometimes, there is no speed! Just stopped there without falling... Awesome!! One of the coolest thing in the show is that they hired a bunch of golf carts to transport people from one hall to another. Not to mention the walking itself is a killer job, getting lost and walking in circle is just pure torture... Thank goodness! Great job organizer!! To conclude the car section coverage, Audi again demonstrated their proud highly sleek booth design by employing a ton of light fixtures. It was an eye feast, and visual stunner, and a visceral enlightenment!